The Capital of the peruvian Black roots Folk, good food and liquor. Ica covers the Ecological Paradaise of Paracas and the enigmatic Nazca Lines, testimonial work of the old peruvian wisdom and engineering. DAY 1: OUTGOING TO CHINCHA. 08:00AM. Meeting of all the travellers on a pre-decided place. Departure to Chincha "Cradle of the Afro-Peruvian Art". 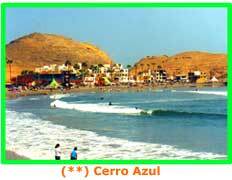 On the road, we'll see the seaside of Cerro Azul (Handicraft Port). Typical Lunch: Sopa seca & Manchapecho. Enjoy the instalations and pool of the place. THE WINE ROUTE: Visit to the touristic wineyard of Naldo Navarro. Tasting of the Pisco, Mistela and Borgoña wine, etc. Visit to the Melchorita sanctuary. The PISCO, our national liquor is a type of brandy distilled from grapes grown in the warm and sunny regions of Peru.The ¨PISCO is the base for the preparation of our National Cocktail: The Pisco Sour. The Pisco Quebranta type is the most recommendable for the Pisco Sour, then we have a lot of varieties using other kinds of pisco (Italy, acholado, atc.) and different proportion in the other ingredients. Shopping of Junco and Totora handicrafts in Grocio Prado, El Carmen, district of the Ballumbrosio Family. Transfer to NAZCA city. Overnight. High Technology : The Famous Nazca Lines and the Pre-Hispanic Aqueducts of Cantayoq. Continental Breakfast. Visit to the Aqueducts of Cantayoq. 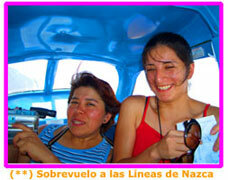 Then, you will fly over the enigmatics Nazca Lines. The Height of the Nazca Culture was between the years 300 B.C. and 700 A.C. These Lines concern one of the big ENIGMAS of the Pre-Inka Culture. They were studied by the Doctor María Reiche. One theory said that it was an Astronomic Calendar. What is very well known, according to the science, is that those lines and trapeziums were made so perfect (in mathematic precision), that the only on way to do it is FROM ABOVE. (See right picture). 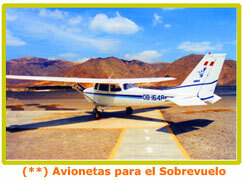 We believe that the old Nazcas knew a technic to fly or elevate? (*) Fees are applied for overflying. During the oveflight you could see the following figures: The Whale, several triangles and trpeziums,the hands, the tree, the parrot, the astronaut, the monkey, the condor, the hummingbird, the spider, the dog and the alcatraz of 285 meters of length. Also, if the weather allows you, you'll see the White Mountain, the highest dune of the world at 2076 meters of altitude. Continental breakfast on a warm rural restaurant. 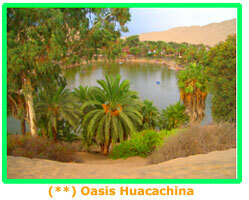 Transfer to the Huacachina Small Lake, a true Oasis suroounded by dunes in Ica city. According to Mrs. Angela Perotti, an italian inmigrant, its waters have healing effects. You'll sail on pedal boats and also there is a chance for riding in "tubulares" or making some sandboard. Typical Lunch. City tour: Visit to the Lord of Luren Church, main square, delight of the chocolates and TEJAS "Helena" and visit to the "Velazco" pastry where you can get the famous "Hot Revolution" and other sweet stuffs. 07:00 Continental Breakfast. Visit to the National Reserve of Paracas. 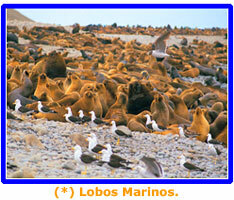 Transfer to the Dock "El Chaco" (Marina) to take the raft and sail to the Ballestas Island. 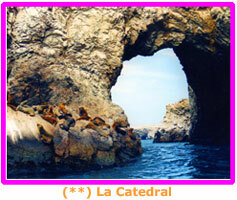 We will see sea wolves, guano birds, flamingos, piqueros, zarcillos and the misterious Cathedral. We'll have the LUNCH in front of the sea in a touristic boulevard in El Chaco dock. 03:00pm. We'll do a breef stop on the main square of Pisco city. Return to Lima. Arrival at 8pm. © (**) DORIS DELGADO TRAVEL & REPS. PERÚ.